Reference: L. A. Solovyov, Full-profile refinement by derivative difference minimization. Journal of Applied Crystallography 37 (2004) 743-749. 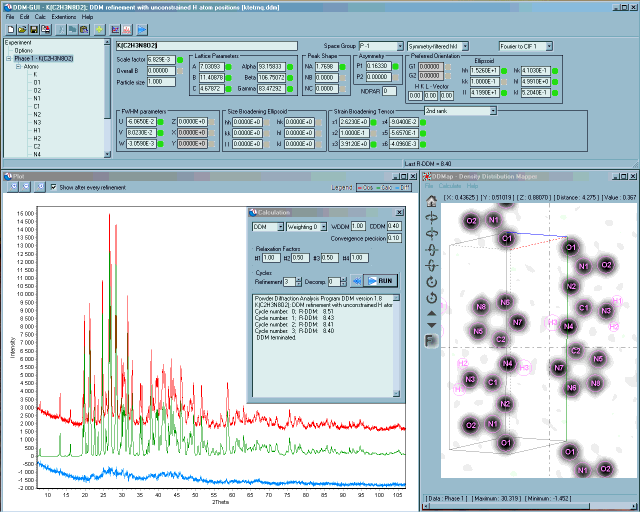 DDM program is designed for crystal structure analysis from powder diffraction data by making use of either Rietveld or Derivative Difference Minimization (DDM) method. In the DDM method the refinement is aimed not at minimizing the absolute difference between the experimental and calculated profiles but at minimizing the oscillations (or curvature) of the difference curve. The squared values of the difference curve derivatives are used in DDM as a measure of the difference curvature. The main advantage of this method is that it does not require the background line modeling or approximations. Eliminating the systematic errors caused by inadequate background definitions, DDM allows structure refinement with increased stability and precision.